The term ‘Bryan Kramer’ or ‘us’ or ‘we’ refers to the owner of the website whose registered office is 30 E. Santa Clara St. Suite 240 San Jose, CA 95113. Our company registration number is14-1837459, Santa Clara County. The term ‘you’ refers to the user or viewer of our website. 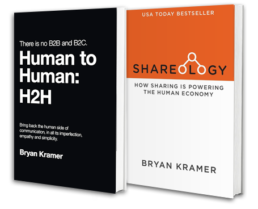 • You may not create a link to this website from another website or document without Bryan Kramer’s prior written consent. If for some reason you cannot attend the course you are registered for, Bryan Kramer will offer a full refund if you notify us within 7 business days of the start of the course. For students who can no longer attend a course that is currently in session, we can no longer offer a refund or credit – however all course videos will be given to the registrant regardless of course participation. If by chance the course is cancelled by Bryan Kramer, full refunds will be given 5 – 7 business days after the course cancellation is communicated to it’s registrants.